Why Do Economists Love Debt So Much? “Mainstream” economics today is home to some rather strange views. Most economists think inflation is good, even something to aim for. They believe that lots of debt is healthy and performance-enhancing. I couldn’t disagree with these assertions more. So it usually pains me to read mainstream financial analysis. Despite this, sometimes I read The New York Times or The Wall Street Journal to gauge what the establishment is thinking. It’s important to understand these views because most of the writers at mainstream outlets happen to share about 99% of their financial views with bankers, central bankers and most politicians. But the mistake that the United States and Europe have made in recent years has not been to issue too much debt. It has been to issue too little – and scrimp on investment in education, transportation and so on. What? Too little debt? The U.S. national debt alone has grown from around $6 trillion in 2000 to more than $21 trillion today. 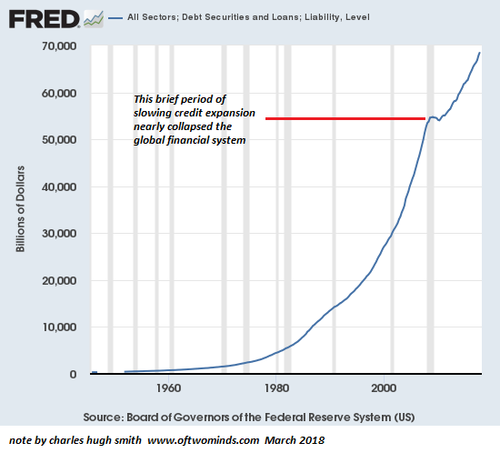 It is still accelerating, currently increasing by more than $1 trillion a year, and we’re not even in a recession (officially). Mr. Leonhardt continues the madness a few lines down. To cluck about the debt may sound sober-minded and responsible. But it often isn’t. Instead, it can be bad economic policy that hurts the country – including future generations. Wait… So if we don’t take on enough debt, it’ll hurt the country and future generations? If we live within our means, harm will come to our children? What kind of logic is that? It’s madness, and, unfortunately, this is how most of the financial establishment sees the world. It seems to view debt as a very useful political tool and massive deficits as unavoidable. There is zero thought given to long-term repercussions. And there’s never a serious discussion about how to pay it off. The chart below shows the growth of credit (debt, loans, liabilities) in the U.S. You can see the 2008 credit crisis clearly (the bump). That tiny bump, a temporary slowdown in the growth of credit, almost destroyed the entire economy. When a system is as highly leveraged as ours is, even a brief slowdown can be devastating. The Fed stopped the establishment system from failing only through desperate measures. It quickly lowered interest rates (which had finally just normalized at around 5% a year or so before!) and kept rates at zero for nearly a decade. The economy became even more reliant on debt to function. I believe this is the real reason mainstream economists love debt so much. They fully realize that without more debt and ever-easier monetary conditions, the system will collapse. They must realize on some level that a day of reckoning has to come. The current system is the definition of unsustainable. But nobody wants it to happen “yet.” So they kick the can farther down the road, making the eventual reckoning more severe each time. I don’t especially enjoy thinking about these darker sides of finance, but the sooner people realize the gravity of our situation, the better off we’ll all be. We must start slashing government spending and eliminating waste and corruption soon if we hope to stave off an epic disaster.